WINNER of 4 JMC Academy 2015 Martini Awards for Best Direction, Best Musical Score, Best Post-Production & Best Overall Picture! What if the only way to be a hero was to become a villain? 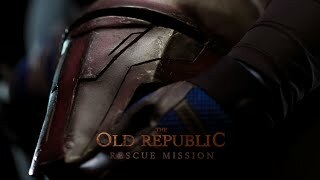 The Old Republic: Rescue Mission is a passion project born from the idea of breaking the bounds of achievability. Begun as a small collective of individuals to soon becoming a larger team, we set out with an aim to create some of the best fan-made content ever to be based from the Star Wars Expanded Universe lore. It is an original story featuring Mission Vao and Revan, set between the events of the KOTOR game and Drew Karpyshyn's novel 'Star Wars: The Old Republic: Revan'. Stephanie Elkington, Cassandra Bleechmore & Matthew Keating. Thank you to our Cast, Crew, Fans & IndieGoGo Supporters! You have all helped in making this project what it is today.